If your teeth are stained or discolored, Zoom! teeth whitening is a great way to jumpstart your teeth whitening process and eventually give you the brilliant smile you’ve always wanted. This in-office teeth whitening system will make your teeth dramatically whiter in about an hour at either of our offices in Marble Falls and Brady, TX. The Zoom! teeth bleaching procedure is both a simple and safe way to whiten teeth and has been proven effective in more than 15,000 dental offices around the world. When you’re considering teeth whitening, you can count on Ritchie Dental Group in Marble Falls, TX and our Zoom! tooth bleaching system to provide reliable and stunning results. Our teeth can be stained by wine, tea, coffee, or tobacco. Even some medication, antibiotics, excessive fluoride, and aging can leave our teeth dull and discolored. Teeth whitening is one of the safest, most accessible ways to transform your smile quickly and effectively. At Ritchie Dental Group, we can brighten your smile with a Zoom! in-office teeth whitening treatment or send you home with a customized whitening kit so you can whiten your teeth on your own time, in the comfort of your own home. You may have heard of “laser teeth whitening.” In reality, “laser teeth whitening” is actually light-activated teeth whitening. Zoom! 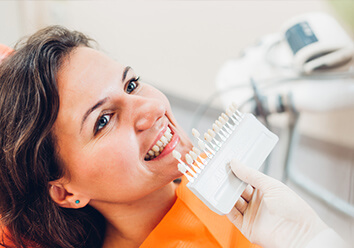 teeth whitening at Ritchie Dental Group in Marble Falls is light-activated, and this system works great for brightening up even seriously stained teeth. Zoom! tooth bleaching can take your teeth up to ten shades whiter, and will remove the toughest stains to create a dazzling smile in just one hour. This revolutionary system produces results that last for years. You can also choose to supplement your new white smile with a take-home touch up kit with comfortable custom trays for easy at home whitening. Regular brushing and flossing, plus an annual touch-up at home will enable you to keep your beautiful smile white for years to come. Zoom! is just one of the many cosmetic dentistry treatments offered at our Marble Falls and Brady, TX dental offices. We invite you to explore other options like porcelain veneers, Invisalign, and dental implants. With so many choices, you can finally achieve whatever you want for your smile.